The European Space Agency (ESA) has joined Russia's Roscosmos program to safely land a spacecraft on Mars on Wednesday, October 19. If everything goes according to plan, they’ll join NASA as the only space agencies in history to effectively land a spacecraft on Mars. This is only a beginning - the lander will then initiate a complete new hunt to search for signs of life on the Red Planet. If the landing is a success, it will actually see the agencies put one spacecraft up into Mars’s atmosphere, and one onto its surface, giving scientists a rare opportunity to record conditions above and below the planet simultaneously. 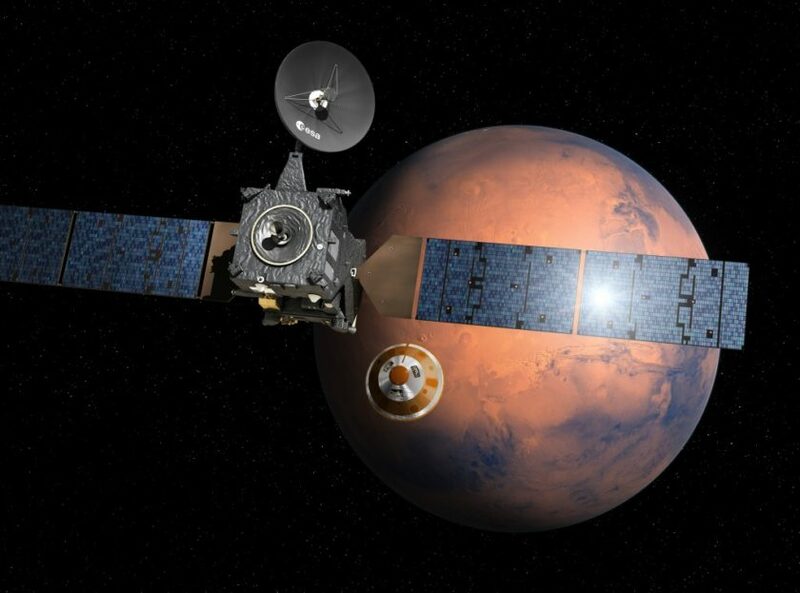 The plan is this: on October 16, the joint Russian-European ExoMars spacecraft will break off into two bits - the Trace Gas Orbiter (TGO), and the Schiaparelli lander. The orbiter has the easy job - it just gets to fly off into Mars’s orbit. The Schiaparelli lander, on the other hand, has three days to prepare for the perfect landing. That involves using an onboard radar to measure Schiaparelli’s height above the surface of the Red Planet, starting at about 7 km, and then kicking its landing apparatuses into gear at about 2 metres above the surface. At this point, it will need to eject its front and back aeroshells - rigid, heat-shielded shells that protect spacecraft from the pressure, heat, and debris of space travel - operate its descent sensors, and deploy the braking parachute. Three groups of thrusters using a propellant called hydrazine will also need to be activated to control the lander’s touchdown speed. If that sounds like it’s going to be incredibly tricky to pull off... you bet it is. As the European Space Agency’s Orbiter flight director, Michel Denis, explains, just uploading the instructions to the ExoMars spacecraft was an achievement on its own. "Uploading the command sequences is a milestone that was achieved following a great deal of intense cooperation between the mission control team and industry specialists," he said. That means mission control will have no power over the landing - it’s all going to be executed by a computer onboard the spacecraft, which will make for a seriously nail-biting final showdown between Schiaparelli and the cold, hard surface of Mars next Wednesday. "The entire sequence is pre-programmed, and Schiaparelli only has one shot," Maddie Stone reports for Gizmodo. "There are no do-overs should anything go wrong." That means if the lander gets the angles even slightly wrong, it will either start to free-fall too fast, and burn up in Mars’s atmosphere, or it’ll bounce off the atmosphere and back into space. The Russians and the Europeans have both tried to achieve Mars landings separately in the past, and each time it’s ended in disaster. But while they don’t have a great track record at this kind of thing alone, maybe they can achieve it together? The ExoMars mission has been split into two parts - the first is next week's historic landing (hopefully), and the second is scheduled for 2020, when a Roscosmos-built lander called the ExoMars 2020 surface platform will deliver the ESA-built ExoMars Rover to the Martian surface. So if all goes well, we’ll have two new rovers on the Mars surface within the next four years. If there really are signs of life hiding somewhere on the Red Planet, it’s up to these little robots to find it. The landing has been scheduled for 2:48pm GMT on Wednesday, October 19 (That's 4:48pm CEST or 10:48am EDT on Wednesday, or 1:48am AEST on Thursday).